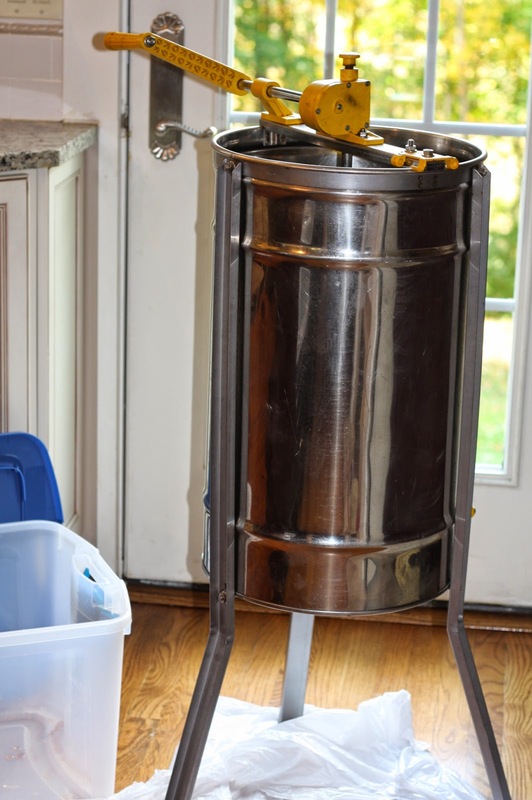 It took three summers of beekeeping to finally have a real honey harvest--a harvest that needed an extractor and purchased jars to put all the honey into. I took about 30 pounds of honey from my two hives this fall. I also harvested about 20 pounds earlier in August. This is the last, very dark honey coming from the extractor. The frames are all lined up with plastic underneath, ready to extract. This front one is a very nice, full frame. Good job girls! This frame is not so full. But all the frames have to be off now so the bees can get ready for winter. They won't cap off honey this late here in New England. Most of my honey supers are mediums, that is, the middle size of frames. I use both wood/wax foundations and also white plastic Pierco frames. Once they are drawn out with wax there is little difference. 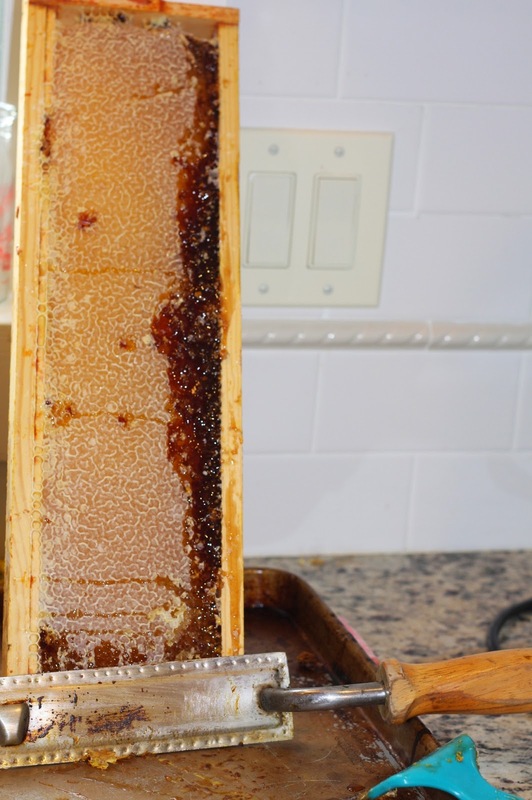 But, it does seem like the honey flew out of the Pierco's faster with less damage to the wax cells. The Pierco frame on the right has little capped honey on this side, but the other side is full. This is a three-frame extractor. It uses centrifugal force to spin the uncapped honey out of the tiny cells. The honey hits the outer wall and runs down into the big, stainless tank. From there, I filter it through two fine mesh filters and a last time through a very fine cloth. They honey is never heated. This is how the frames fit into the extractor. I have to flip them over to spin the second side. The honey is Very dark in the fall. It is nothing like the very, very light honey that I entered, and won a blue ribbon, at the fair. The difference is in the kinds of nectar available to the bees. 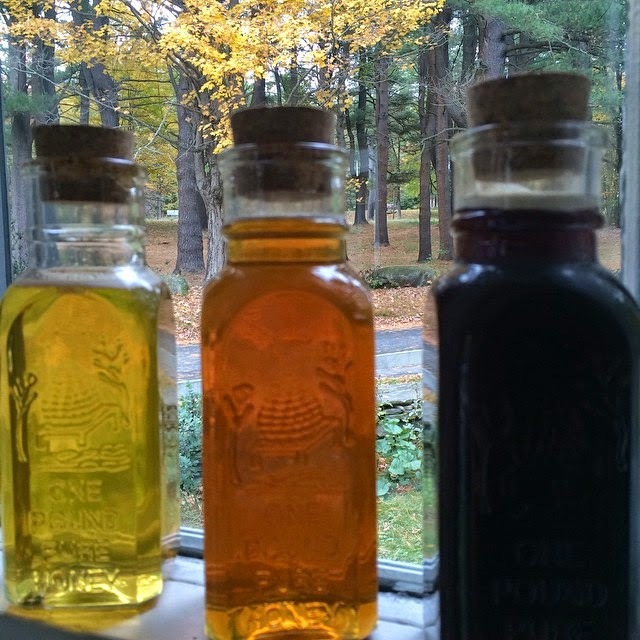 Here are the three colors of honey that the bees made this year. Very light is from the early summer flowers, harvested in August for the fair. The middle is more amber and was found in the center of my frames. I had to extract two times from some frames in order to keep the different honeys separate. And the very dark(which is a bit more see through than we see here on this gray day photo) is from the later nectar flow from August on. I Love these Muth jars with their embossed beehive and corks. This is the one pound size.